June | 2015 | For What Saith the Scriptures? “Seeing it is one God, which shall justify the circumcision by faith, and uncircumcision through faith” (Romans 3:30). Why does the King James Bible say, “circumcision by faith” and “uncircumcision through faith?” There is a difference, but why is there a difference? (This distinction is lost in modern English versions such as New Revised Standard Version [NRSV], the Living Bible, and the New Living Translation [NLT].) What is the significance? We will search the Scriptures for the answer. The word “circumcision” here is a reference to the nation Israel, and “uncircumcision” refers to the Gentiles (nations). But, why this difference of “by faith” for Israel and “through faith” for Gentiles? While not original to me, I will be glad to tell you the best explanation that I have found. The expression “by faith” emphasizes the means or mechanism, the agency. It is this that is emphatic in Israel’s salvation. In Israel’s program, a Jew needs to positively respond to what God is saying or doing. Remember, “So then faith cometh by hearing, and hearing by the word of God” (Romans 10:17). Unbelieving Israel did not have faith. They just had works, and works alone have never saved anyone (in our Dispensation of Grace or in Israel’s prophetic program). “By faith” shows Israel that they cannot be saved/justified by their works. They wrongly thought they could (for instance, see the attitude of a Pharisee in Luke 18:9-14). “Through faith” is the system or process through which one participates in what God is saying or doing. Today, the system of faith is emphasized; the system of our works/Law-keeping is not the issue. Our faith in Jesus Christ’s finished crosswork (that crosswork being His faith) is the mechanism whereby God justifies us before Himself. » What about those who have not heard? » Can Jews who believe in God, the Father, but who reject Jesus, be saved from eternal damnation? Pentecostals and other Charismatics hold to the doctrine of “healing in the Atonement.” Predicated upon Isaiah 53:5, the basic idea is that Jesus Christ purchased physical healing for us at Calvary (the word “Atonement” obviously being Christ’s sacrificial death). Is this really what the Prophet Isaiah was saying in that famous passage? We will look at God’s Word and see what it actually says. Indeed, Isaiah 53:5 says of Messiah’s crosswork, “But he was wounded for our transgressions, he was bruised for our iniquities: the chastisement of our peace was upon him; and with his stripes we are healed.” But, before we just grab the part of the verse we like and make it say something we want it to say, we need to let the Bible interpret itself. We do not need a lexicon, Dr. “So-and-So’s” commentary, or some denominational handbook to explain Isaiah. The Holy Spirit Himself will teach us. Will we be willing to hear Him and conclude that just maybe He might be right? It is supposed that, through Jesus’ shed blood, we have the authority to declare healing and recovery from every disease and illness. If we are Christians, we should not be sick or dying. According to these “healing-in-the-Atonement” adherents, Calvary’s cross is the means whereby Father God has guaranteed us Christians physical healing. We just have to claim that deliverance in “Jesus’ name.” We are told not to believe the diagnoses from medical professionals. While they see cancer in us, heart disease in us, or some other verifiable medical condition, we are told to ignore that reality and live in a delusional world. We are urged to declare, “I have Jesus not cancer! I have Jesus not a knee injury or back pain! I have Jesus, Jesus, Jesus….” Surely, dear friends, this assumption is extremely dangerous, spiritually and physically. In fact, it is not faith at all. It is unbelief! The Apostle Peter quoted Isaiah 53:5 in 1 Peter 2:24. We will look at this verse in context: “ For even hereunto were ye called: because Christ also suffered for us, leaving us an example, that ye should follow his steps:  Who did no sin, neither was guile found in his mouth:  Who, when he was reviled, reviled not again; when he suffered, he threatened not; but committed himself to him that judgeth righteously:  Who his own self bare our sins in his own body on the tree, that we, being dead to sins, should live unto righteousness: by whose stripes ye were healed. For ye were as sheep going astray; but are now returned unto the Shepherd and Bishop of your souls.” Through Peter, the Holy Spirit interpreted Isaiah 53:5 for us. The healing is not physical healing. It is a spiritual healing, a healing of the soul, forgiveness of sins, the spirit given life. He “bare our sins in his own body on the tree” is indicative of spiritual healing rather than physical healing. By the way, the verse before Isaiah 53:5, verse 4 of Isaiah chapter 53, is a reference to physical healing under special circumstances: “Surely he hath borne our griefs, and carried our sorrows: yet we did esteem him stricken, smitten of God, and afflicted.” The Holy Spirit interpreted this verse for us in Matthew 8:16-17: “ When the even was come, they brought unto him many that were possessed with devils: and he cast out the spirits with his word, and healed all that were sick:  That it might be fulfilled which was spoken by Esaias the prophet, saying, Himself took our infirmities, and bare our sicknesses.” Isaiah 53:4 predicted Messiah’s healing ministry, the miraculous demonstrations that validated the Gospel of the Kingdom that He and His apostles preached. The sicknesses that brought Israel sorrow, Jesus came and healed them. Their infirmities that brought them grief, Jesus came and healed them. Please make special note that Jesus’ earthly ministry of healing miracles occurred before the cross, not at the cross or through the cross. Interestingly, when James wrote about physical healing (James 5:13-15), He did not quote Isaiah 53:5, “with his stripes we are healed.” Is that not a demonstration that the “healing” of Isaiah 53:5 is a different type of healing than that of James 5:13-15? The Apostle, and the Holy Spirit guiding him, knew this to be true, and thus did not quote the verse. Another fascinating tidbit is that James 5:13-15 is a passage of Scripture commonly appealed to in order to support modern-day healing crusades. Evidently, unlike those who like to quote him, James did not believe there was physical healing in the Atonement. Those physical healing verses referenced above were not written to or about us in this the Dispensation of the Grace of God. When advising sick Timothy, Paul never told him, “Claim your healing in the Atonement, Timothy! God has promised you deliverance from those sicknesses! You are a Christian and you are not supposed to be ill!” Yea, on the contrary, Paul instructed Timothy to use wine—medicine—for his stomach problems and his frequent sicknesses (1 Timothy 5:23). The Apostle also admitted that, in his last epistle, he had to leave a brother in Christ sick at Miletum: there was no miraculous healing for Trophimus in 2 Timothy 4:20. Moreover, there was no physical healing for Paul himself in Acts 16:22-23,33 (when he was beaten with “many stripes”); 2 Corinthians 11:22-28 (his various health risks and injuries sustained in the ministry); 2 Corinthians 12:7-10 (which included his “infirmities”); and Galatians 4:13-15 (his “infirmity of the flesh,” possibly a reference to partial blindness in light of Galatians 6:11). The danger in claiming physical healing through Calvary’s cross is that well-meaning and desperate people often overlook the spiritual healing available through Calvary. It is a focus on the temporary healing of a body that will go to the grave and rot and decay, rather than an emphasis on the salvation of the spiritual body that will last forever. One day, we who have relied exclusively on the Lord Jesus Christ, His perfect sacrifice at Calvary for our sins, will receive glorified bodies fashioned like His body (Philippians 3:20-21). The fifteenth chapter of 1 Corinthians goes into great detail about that resurrection of Christians at the Rapture, when Jesus Christ comes to take His Body into the heavenly places. You can read more about that in your own personal Bible study. In the above verses, Paul talked about how we suffer under the curse of sin. Even as Christians, our bodies grow sick and eventually die. Being a child of God does not insulate us from illness and it does not guarantee us good health. As long as God continues to operate our program, Israel’s program will be postponed, and as long as Israel’s program is postponed, the curse of sin being lifted (in Israel’s kingdom) is also delayed. Anyone who says otherwise is not sound in his or her theology. Beloved, all the religious nonsense aside, and in contradistinction to the “healing-in-the-Atonement” doctrine, the Bible view is, we are subject to sickness, we can and do have sickness, and whether well or sick, we still have Jesus. It is not that we ignore our sickness and refuse medical treatment. We have sickness and we also have Jesus Christ. It is not “We have Jesus not sickness.” Whether or not we live with a sickness for the rest of our earthly lives is irrelevant. God’s grace is still sufficient in all troubles, as Paul learned about his own trials, tribulations, and illnesses (2 Corinthians 12:7-12). We can glory in our tribulations (Romans 5:1-5), find value in those trials and troubles. Whether or not that sickness is terminal (takes our life) is irrelevant. God has given us the grace to endure all of life’s troubles (Philippians 4:13). We can use the eyes of faith to see that these problems are only temporary. Thank God that they are not forever. Compared to eternity, they are a simple blink of the eye, a fraction of a second, nothing. The Lord Jesus Christ is with us, in health or in sickness! Research into the history of the “healing-in-the-Atonement” tenant yields proof that it has left many deceived, disappointed, and dead people in its wake. Innumerable souls disregarded medical advice because they did not understand God’s Word rightly divided. Until the day that their lives were taken by the various diseases that religion said they did not suffer from, they kept quoting God’s healing verses to Israel as though those verses were given to them in the current dispensation. They found false hope and pseudo-peace in divine words given to others. Not only were they deceived by others, they deceived others with their own actions, and wrested God’s Word in the process. » Does God chasten us when we sin? » Did the 12 preach the Gospel of the Kingdom after Christ ascended? Should women serve in the ministry? SHOULD WOMEN SERVE IN THE MINISTRY? IF SO, HOW? What role, if any, should women play in the Christian ministry? Should women be pastors, evangelists, or Bible teachers? What about the prophetesses in the Bible? Does that mean there are female prophets today in the Body of Christ? Is the Spirit of God leading women today to head churches and ministries? While this is a very delicate and often controversial topic, we have no interest whatsoever in supporting any denominational viewpoint! If we are Bible believers, then we must be Bible students. We cannot believe something we have neither read nor studied. We need to be honest with ourselves and the Bible text. If we are merely interested in maintaining a church tradition, we are not Bible believers, but “tradition believers.” Dear friends, let us search the Scriptures to see how God used and uses Christian women to accomplish His will. Brethren, that is the sure way to be Bible believers! ARE GOD AND THE APOSTLE PAUL MISOGYNISTIC? Before we begin, it is important to note that the Apostle Paul has often been accused of misogyny. His epistles are commonly viewed as hateful toward women. I do not doubt that people in Paul’s day called him a “woman hater.” After all, they do it today! Let it be clearly understood here. God does not hate women, Paul did not hate women, and I do not hate women. Anyone who says God hates women has not read their Bible. Considering the treatment of women in Bible days, especially in non-Christian cultures, Christianity was influential in liberating and honoring women. Anyone who says Paul hated women obviously glossed over what the Apostle wrote in Romans 16:1-6, Ephesians 5:25-33, Colossians 3:19, and 2 Timothy 1:5. Anyone who says that I hate women is someone who really knows nothing about what I have written about them. While God does not hate women, He has established an order in creation. Let it be clearly understood here that there is a divine order regarding sexes. If we rebel against the way the Creator God designed human life to function, we will doubtless have unanswerable confusion and endless trouble. Our marriages will be ruined and our family lives will be wrecked. Immediately after the Fall of man into sin, God said to Eve, “…thy desire shall be to thy husband, and he shall rule over thee” (Genesis 3:16). This is not—I repeat, NOT—instructing husbands to bully their wives and/or treat them as slaves. The verse is talking about a spiritual headship. God has established an order in creation. We would do well if we just followed what God decreed, rather than abusing the order (male chauvinism) or disregarding it entirely (feminism). The Creator God has divinely appointed men to be spiritual leaders. This applies to both the home setting and the local church setting. The Bible says in Ephesians 5:22-24: “ Wives, submit yourselves unto your own husbands, as unto the Lord. For the husband is the head of the wife, even as Christ is the head of the church: and he is the saviour of the body. Therefore as the church is subject unto Christ, so let the wives be to their own husbands in every thing.” Again, the husband is to be his wife’s covering (protection). A husband is to guard his wife against Satan’s attacks by guiding her in sound Bible doctrine (God’s Word). Adam failed to do this, and look at what happened to the human race! Notice 1 Corinthians 14:34-35: “ Let your women keep silence in the churches: for it is not permitted unto them to speak; but they are commanded to be under obedience, as also saith the law [referring to Genesis 3:16 above]. And if they will learn any thing, let them ask their husbands at home: for it is a shame for women to speak in the church.” Again, husbands are to teach God’s Word to their wives. Women were not to exercise the gift of speaking in tongues (the context of 1 Corinthians chapter 14). Ephesians 6:4 says that it is primarily the father’s responsibility to teach his children God’s Word: “And, ye fathers, provoke not your children to wrath: but bring them up in the nurture and admonition of the Lord.” A bishop is one “that ruleth well his own house, having his children in subjection with all gravity; (For if a man know not how to rule his own house, how shall he take care of the church of God? )” (1 Timothy 3:4-5). Could the Bible be any clearer? This is plain, simple English my dear readers. We would do well if we just believed and obeyed the passage, rather than tossing aside these verses for sake of doing our own thing. The Bible says in 1 Corinthians chapter 11, in part: “ But I would have you know, that the head of every man is Christ; and the head of the woman is the man; and the head of Christ is God. For a man indeed ought not to cover his head, forasmuch as he is the image and glory of God: but the woman is the glory of the man. For the man is not of the woman; but the woman of the man. Neither was the man created for the woman; but the woman for the man. For this cause ought the woman to have power on her head because of the angels. Nevertheless neither is the man without the woman, neither the woman without the man, in the Lord. For as the woman is of the man, even so is the man also by the woman; but all things of God.” This is not just in the marriage relationship. The context of 1 Corinthians is the local assembly of Christians, the local church. Once more, God’s design in creation is that men be the spiritual leaders. Period. The Bible could not be clearer in 1 Timothy chapter 2, when it talks about the local church operations: “ Let the woman learn in silence with all subjection. But I suffer not a woman to teach, nor to usurp authority over the man, but to be in silence. For Adam was first formed, then Eve. And Adam was not deceived, but the woman being deceived was in the transgression. Notwithstanding she shall be saved in childbearing, if they continue in faith and charity and holiness with sobriety.” This passage needs no exposition. It says exactly what it means and it means exactly what it says. Whether in church or at home, men are to be the spiritual leaders. Make no mistake, dear readers. This does not—I repeat, NOT—mean that Christian women have no role in the Christian ministry. Paul had many female companions in the ministry. He actually took the time to commend them and name some of them. There was Phebe (Romans 16:1-2), Priscilla (and her husband Aquila; Acts 18:2,18,26; Romans 16:3-4; 1 Corinthians 16:19; 2 Timothy 4:19), Mary in Rome (Romans 16:6), Lydia in Philippi (Acts 16:14-15,40), Euodias and Syntyche in Philippi (Philippians 4:2), and “other women” (Philippians 4:3). These precious Christian ladies did not have leadership roles, but they still served in vital capacities in the Christian ministry. It is believed that Phebe may have personally delivered the epistle of Romans to Rome! Priscilla, working with her husband Aquila, taught God’s Word rightly divided to well-versed, but confused, Apollos. Mary in Rome was a very hard worker in the ministry, helping Paul much. Lydia housed Paul and his companions in her home—probably cooking for them, nursing their wounds, and caring for them as a mother would her children. Had Paul been a woman hater, surely he would not have commended them. Even today, women in the local church can host ladies’ fellowships at their own homes. They can cook in, clean, and decorate the local church. They can sing in the choir or teach children’s Sunday School. They can prepare meals for the local assembly, plan and organize weddings and baby showers at the church building, and so on. The twelfth chapter of 1 Corinthians talks about how all Christians have their own roles, and all of these roles enhance and build up the Body of Christ in some way. Women can also become missionaries and serve the Lord in foreign lands, if they so desire. If they are married, they can accompany their husbands in sharing the Gospel of the Grace of God with other people. This is very much like what Priscilla did with Aquila. He was the leader and she was the follower, his support. Make special note how it was a husband leading his wife, not a wife leading her husband. WHAT ABOUT THE PROPHETESSES IN THE BIBLE? I can just about hear this objection in reply to our previous paragraphs, so I will delay no further in answering it. In an effort to encourage and defend women preachers, some have resorted to the Bible verses that describe the ministries of prophetesses. Prophetesses were the exception—not the norm—in Scripture. Let me repeat. It was abnormal to have prophetesses in the Bible. Please let me explain how we know this. The overwhelming testimony of Scripture is that men were spiritual leaders. Not one woman is known to have written any portion of the Bible. Moses, Isaiah, Elijah, Elisha, Jonah, Ezekiel, Micah, Hosea, Jeremiah, Daniel, Joel, Amos, Obadiah, Samuel, Joshua, Ezra, Nehemiah, Job, David, Solomon, Nahum, Habakkuk, Zechariah, Haggai, Malachi, et cetera were all men. Only male relatives of Aaron were to be priests in Israel. There were no priestesses whatsoever in the Mosaic Law system. Look at the apostles. None were women. Peter, Andrew, James, John, Philip, Bartholomew, Thomas, Matthew, James, Nathanael, Simon, Judas, Paul, Barnabas, et cetera. Acts 13:1 mentions prophets and teachers at Antioch—Barnabas, Simeon/Niger, Lucius, Manaen, Saul/Paul. Again, they were all men. Think about Timothy and Titus. Men. Women were not to exercise the gift of speaking in tongues (1 Corinthians 14:33-34). Only Christian men spoke in tongues. In the future, the 144,000 Jewish preachers during the Tribulation. The 144,000 are men, “not defiled with women” (Revelation 14:1-4)! Notice that the bishops and deacons in this the Dispensation of the Grace of God were to be “husbands of one wife.” This qualification precludes (prohibits) female bishops and deaconesses (see 1 Timothy 3:1-13; Titus 1:6-9). One of the main troubles in Corinth was that boisterous women were usurping the roles of leadership in the local church. The first half of 1 Corinthians chapter 11 dealt with this issue of female submission in the local church. (For more info, see our study at the end of this article titled, “Should Christian women wear head coverings?”) When talking about spiritual gifts given to leaders in the Church the Body of Christ, Paul in Ephesians 4:11 only lists “prophets.” There is no reference whatsoever to the feminine form. There is no reference whatsoever to prophetesses in this the Dispensation of Grace. There is no reference whatsoever to prophetesses functioning in the Church the Body of Christ. Dear friends, we need not run to Israel’s program and force those “prophetess” verses into our program. There have never been legitimate prophetesses in the Body of Christ and there never will be legitimate prophetesses in the Body of Christ. So, this leads to an important question, and I will not hesitate in mentioning and answering it. If men were to be spiritual leaders, why would there be prophetesses (female prophets) in the Bible? Why Miriam (Exodus 15:20)? Why Deborah (Judges 4:4)? Why Huldah (2 Kings 22:14; 2 Chronicles 34:22)? Why Isaiah’s unnamed “prophetess” wife (Isaiah 8:3)? Why Anna (Luke 2:36)? Why Philip’s four virgin daughters “which did prophesy” (Acts 21:9)? Why these prophetesses? Pay very close attention here. There were just nine listed in the Bible’s canon that covers roughly 6,000 years. To repeat, prophetesses were the exception rather than the norm. Why were they needed? It is a sad fact but we must say it without hesitation. Prophetesses were needed because the men were slack in their responsibility as spiritual leaders. When no man was available, God used women to speak on His behalf. A prophetess’ ministry was God’s rebuke against men. It was His way of publicly denouncing men’s spiritual carelessness. Furthermore, when neither man nor woman was available, God used a donkey as His mouthpiece (Numbers 22:28-30; 2 Peter 2:16)! How is that for a criticism? Even today, it is common to find a household—or even a local church—where the husband-father is not the spiritual leader. He has either abandoned his family entirely, or he is physically present but spiritually absent. In these homes, the dear mother brings the kids to church, teaches them about spiritual matters, et cetera. We recall the classic Bible account of young Timothy who grew up learning the Bible from his grandmother Lois and his mother Eunice (2 Timothy 1:5; 2 Timothy 3:15). Timothy’s mother was “a Jewess, and believed” and his father, “a Greek,” was either unbelieving or deceased (Acts 16:2). Had it not been for faithful Lois and Eunice, Timothy may have never been able to serve with Paul. It is one of the saddest situations in all the world to see a father showing little to no interest in being the spiritual pillar in and guide for his own family. It is truly disastrous when there is so much deception and spiritual mischief in this world, and the individual whom God ordained in the home to be the guard is absent or “sleeping on duty.” How many numerous poor souls now in prison, could have avoided such a lifestyle and fate had they only had a stable, caring, loving and Christian father figure at home! Awful, how awful, dear friends, oh, how awful, how awful! Remember, precious readers, Satan used Eve to attack Adam’s headship. Through Adam’s slothfulness in being the spiritual head, Satan attacked the whole human race. Through the human race, Satan attacked God’s purpose and plan for the earth. It started small and grew exponentially. Satan is a very sneaky individual. He starts off with the family lacking a strong spiritual leader (husband-father), and from the home, he targets all of society. Those who leave that disorganized home then establish their own spiritually-chaotic homes. It continues every generation until a man takes responsibility and he gets into the Bible, gets the Bible into him, and then gets the Bible into his family! If there are any Christian men reading this, take heed! Beware! Wake up! Embrace your God-given responsibility, man! Wake up! Wake up! Wake up! Brother, your wife needs you! Brother, your children need you! Wake up! Wake up! Wake up! When I read, hear about, or see a woman giving a sermon or Bible lesson to a crowd of men and women, I am deeply disturbed to be reminded of the homes and churches without spiritual husband-fathers. This is not the arrangement the Holy Spirit approves. No woman led by the Holy Spirit will ignore 1 Timothy 2:11-15 and 1 Corinthians 14:34-35. No man led by the Holy Spirit will ignore those passages either. I do not care how many degrees she has, how well she speaks, or how fervent her desire. According to Almighty God, she has no business teaching men in a local church or home setting. None! Period. The woman may be well meaning and the men who appointed her may also be sincere, but the Apostle Paul could not be clearer that men are to lead the church and the home. God’s design in the marriage relationship is that the husband is the head of the wife (Ephesians 5:23), not the other way around. The husband is to lovingly and gently lead his wife into spiritual truth. In the local church setting, men are to lead, just as in the home setting. Unless we have a church tradition to keep, we will understand, believe, and follow these verses. At this point, someone may voice another objection: “Brother Shawn, but what about those women preachers in Corinth?” Well, the Bible does indeed talk about women praying or prophesying with their heads uncovered: “But every woman that prayeth or prophesieth with her head uncovered dishonoureth her head: for that is even all one as if she were shaven” (1 Corinthians 11:5). Firstly, I will openly admit this verse exists in the Bible. Yet, I will also admit that there is no other reference in Paul’s epistles to women preachers in the Body of Christ. As with the “spiritual” “gift” of speaking in gibberish, women preachers only appear in a carnal, worldly, spiritually immature local assembly at Corinth. To model our beliefs and practices after the Corinthians’ is downright silly! To appeal to Corinth as the standard for godly ministry and holy living is utterly absurd! It is spiritual madness to the utmost! Secondly, the very last passage that you would want to use to defend women preachers would be 1 Corinthians chapter 11! As we commented earlier, it was in those same verses that Paul affirmed the headship of men in the local assembly. Notice that the verse mentioned women praying or prophesying with their heads uncovered. That is bad rather than good. Compared to the cultural standards of that time and place, those women were rebellious, domineering, and unfeminine. It was also in this very epistle that Paul told those “masculine” Christian ladies to be quiet and cease usurping male leadership in the local assembly at Corinth. We saw that earlier in 1 Corinthians 14:33-34. Again, for more information, you can see the study linked at the end of this article, which discusses the issue of women and head coverings. Certainly, God wants all Christians to preach the Gospel to lost people, and God wants all Christians to share the Bible with lost people, but church leadership is reserved for men. The Bible could not be clearer in 1 Timothy chapter 2: “ Let the woman learn in silence with all subjection. But I suffer not a woman to teach, nor to usurp authority over the man, but to be in silence. For Adam was first formed, then Eve. And Adam was not deceived, but the woman being deceived was in the transgression. Notwithstanding she shall be saved in childbearing, if they continue in faith and charity and holiness with sobriety.” The very reason why Eve was deceived and got into trouble was because she followed Satan’s enticement to ignore Adam’s spiritual leadership (see Genesis chapter 3). Eve should have consulted Adam rather than hearkening unto the Serpent. Both at home and in church settings, Christian women will be “saved” today from Satanic deception if they just submit and follow their godly husbands as those men follow Jesus Christ! Bishops and deacons must be a “husband of one wife” (1 Timothy 3:2,11,12; Titus 1:6). Unless God was advocating a homosexual lifestyle, these simple verses indicate that women cannot serve as bishops (pastors) or deacons. The Holy Spirit would not cause them to disobey these verses. The only way there would be a female pastor/bishop or female deacon (deaconess) is if she defied the Holy Spirit. Women in the local church have a ministry toward other women: “ The aged women likewise, that they be in behaviour as becometh holiness, not false accusers, not given to much wine, teachers of good things;  That they may teach the young women to be sober, to love their husbands, to love their children,…” (Titus 2:3-4). Women can also serve as missionaries in foreign countries, perhaps laboring with their husbands (if applicable). They can teach younger children in the local assembly. They can be spiritual mothers to be people in the assembly. Women can pray for their pastor-husbands, their missionary-husbands, their teacher-husbands, et cetera. These are just some of the ways Christian women can serve the Lord Jesus Christ. » Must Christian women wear head coverings in the Bible? » Should I raise my hands in worship? » Are all Christians “ambassadors,” or just Paul and his ministry companions? My friend, I would be delighted to help you better understand these two biblical concepts. First, we will introduce some general information, and then we will delve into the details. A survey of scores of verses is necessary, but we will try to keep it simple for sake of clarity and brevity. Since this can be an intricate topic, you may want to read the conclusion first, and then read the study to see the logic behind the conclusion. To the Scriptures we go! When the term “the kingdom of God” appears in the Bible, it is a general reference to God’s domain, the realm of His influence (the righteous world system, Christians, and heaven). This term can apply both to redeemed Israel and the Church the Body of Christ. The phrase “the kingdom of God” is in contradistinction to the realm in which Satan and his cohorts operate (the evil world system, lost [unregenerate] mankind, hell, the lake of fire, fallen angels, et cetera). A person enters “the kingdom of God” when God rescues/saves him or her from Satan’s realm—having sins forgiven, being declared righteous before God, fellowship with God, able to participate in His will, not going to hell anymore, and so on. You can refer to Matthew 21:31, Luke 17:21, and Colossians 1:13. Now, the other term, “the kingdom of heaven,” goes back to a concept first introduced when Moses wrote about “the days of heaven upon the earth” (Deuteronomy 11:21). Moses referred to the day when God’s earthly kingdom would be established through Israel. Companion passages are Job 19:25-27, Isaiah chapter 11, Isaiah chapter 33, Isaiah chapter 35, Isaiah chapter 61, et cetera. There would be no sickness and the curse of sin would be lifted. It would literally be heaven on Earth! All of God’s saints would be bodily resurrected to enter that kingdom. In that day, the God of Heaven would have His kingdom present on Earth for all to see. It would be a literal, physical, visible earthly kingdom, modeled after the reigns of King David and King Solomon. The Prophet Daniel, when interpreting King Nebuchadnezzar’s dream, said in Daniel 2:44: “And in the days of these kings shall the God of heaven set up a kingdom, which shall never be destroyed: and the kingdom shall not be left to other people, but it shall break in pieces and consume all these kingdoms, and it shall stand for ever.” This is yet future, dear friend. Jesus Christ is coming again to destroy all of this world’s evil governments and He will establish His righteous kingdom on this planet! The Lord Jesus said in Matthew 6:33: “But seek ye the kingdom of God, and his righteousness; and all these things shall be added unto you” (cf. Luke 12:31). Before Israel could receive her material blessings from God (food, drink, clothing, shelter, et cetera), she first needed to have spiritual blessings from God (her sins forgiven and a right standing before God, or justification). Israel, entangled with an apostate religious system at Christ’s time, needed to first seek salvation in and through the Lord Jesus, her citizens needed to become saints (citizens of the kingdom of God), she needed to be delivered from the power of darkness (Satan and sin), before she could enjoy material prosperity in that earthly kingdom that Jesus Christ would establish. Israel needed to be redeemed (spiritually cleansed) before going into a cleansed land, the Promised Land. Otherwise, she would pollute that purified land. The phrase “the kingdom of God” appears 69 times in our King James Bible: Matthew 6:33, Matthew 12:28, Matthew 19:24, Matthew 21:31, Matthew 21:43, Mark 1:14, Mark 1:15, Mark 4:11, Mark 4:26, Mark 4:30, Mark 9:1, Mark 9:47, Mark 10:14, Mark 10:15, Mark 10:23, Mark 10:24, Mark 10:25, Mark 12:34, Mark 14:25, Mark 15:43, Luke 4:43, Luke 6:20, Luke 7:28, Luke 8:1, Luke 8:10, Luke 9:2, Luke 9:11, Luke 9:27, Luke 9:60, Luke 9:62, Luke 10:9, Luke 10:11, Luke 11:20, Luke 12:31, Luke 13:18, Luke 13:20, Luke 13:28, Luke 13:29, Luke 14:15, Luke 16:16, Luke 17:20, Luke 17:21, Luke 18:16, Luke 18:17, Luke 18:24, Luke 18:25, Luke 18:29, Luke 19:11, Luke 21:31, Luke 22:16, Luke 22:18, Luke 23:51, John 3:3, John 3:5, Acts 1:3, Acts 8:12, Acts 14:22, Acts 19:8, Acts 20:25, Acts 28:23, Acts 28:31, Romans 14:17, 1 Corinthians 4:20, 1 Corinthians 6:9, 1 Corinthians 6:10, 1 Corinthians 15:50, Galatians 5:21, Colossians 4:11, and 2 Thessalonians 1:5. In your personal study, you can look at all of these references. We will look at only some of them here. The term “the kingdom of heaven” appears 32 times in our King James Bible, it only appears in the book of Matthew, and it is always a reference to God’s earthly kingdom (commonly called “The Millennium” or “The 1000-Year Reign of Jesus Christ”): Matthew 3:2, Matthew 4:17, Matthew 5:3, Matthew 5:10, Matthew 5:19, Matthew 5:20, Matthew 7:1, Matthew 8:11, Matthew 10:7, Matthew 11:11, Matthew 11:12, Matthew 13:11, Matthew 13:24, Matthew 13:31, Matthew 13:33, Matthew 13:44, Matthew 13:45, Matthew 13:47, Matthew 13:52, Matthew 16:19, Matthew 18:1, Matthew 18:3, Matthew 18:4, Matthew 18:23, Matthew 19:12, Matthew 19:14, Matthew 19:23, Matthew 20:1, Matthew 22:2, Matthew 23:13, Matthew 25:1, and Matthew 25:14. Again, in your own personal study, you can look at these references. We will look at only some of them here. Mark 1:14-15 says that Jesus Christ went around preaching “the gospel of the kingdom of God,” saying, “The time is fulfilled, And the kingdom of God is at hand: repent ye, and believe the gospel.” Luke 9:2, “And he sent them to preach the kingdom of God, and to heal the sick,” is similar usage of the term. Luke 9:11 says, “And the people, when they knew it, followed him: and he received them, and spake unto them of the kingdom of God, and healed them that had need of healing.” Luke 9:60,62 and Luke 16:16 are other examples. Again, “the kingdom of God” would here refer to both the realm of God’s influence and its visible manifestation (God’s earthly kingdom was on the verge of being established when Jesus Christ showed up). “The kingdom of God” and “the kingdom of heaven” are so closely connected that it is difficult to separate them in Israel’s program. “Because it is given unto you to know the mysteries of the kingdom of heaven, but to them it is not given” (Matthew 13:11)—parallel verse, Luke 8:10, says “the kingdom of God,” meaning they are interchangeable here. “Another parable put he forth unto them, saying, The kingdom of heaven is like to a grain of mustard seed, which a man took, and sowed in his field” (Matthew 13:31)—parallel verse, Luke 13:18, says “the kingdom of God,” meaning they are interchangeable here. “Another parable spake he unto them; The kingdom of heaven is like unto leaven, which a woman took, and hid in three measures of meal, till the whole was leavened” (Matthew 13:33)—parallel verse, Luke 13:20, says “the kingdom of God,” meaning they are interchangeable here. “And he said unto them, Unto you it is given to know the mystery of the kingdom of God: but unto them that are without, all these things are done in parables:” (Mark 4:11). “And he said, So is the kingdom of God, as if a man should cast seed into the ground;” (Mark 4:26). “And he said, Whereunto shall we liken the kingdom of God? or with what comparison shall we compare it?” (Mark 4:30). “Verily I say unto you, That there be some of them that stand here, which shall not taste of death, till they have seen the kingdom of God come with power” (Mark 9:1)—parallel verse, Luke 9:27, says “the kingdom of God.”—and other parallel verse, Matthew 16:28, says “the Son of man coming in his kingdom.” That would be a reference to Jesus Christ returning to establish that earthly kingdom. “Suffer the little children to come unto me, and forbid them not: for of such is the kingdom of God” (Mark 10:14)—parallel verse, Luke 18:16. “Whosoever shall not receive the kingdom of God as a little child, he shall not enter therein” (Mark 10:15)—parallel verse, Luke 18:17. “Thou art not far from the kingdom of God” (Mark 12:34). “I must preach the kingdom of God to other cities also” (Luke 4:43). “Blessed be ye poor: for yours is the kingdom of God” (Luke 6:20)—parallel verse, Matthew 5:3, says “the kingdom of heaven,” meaning they are interchangeable here. “But he that is least in the kingdom of God is greater than [John the Baptist]” (Luke 7:28). “And it came to pass afterward, that he went throughout every city and village, preaching and shewing the glad tidings of the kingdom of God: and the twelve were with him,” (Luke 8:1). “And heal the sick that are therein, and say unto them, The kingdom of God is come nigh unto you” (Luke 10:9). “Even the very dust of your city, which cleaveth on us, we do wipe off against you: notwithstanding be ye sure of this, that the kingdom of God is come nigh unto you” (Luke 10:11). “And he said unto them, Verily I say unto you, There is no man that hath left house, or parents, or brethren, or wife, or children, for the kingdom of God’s sake,” (Luke 18:29). “Jesus answered, Verily, verily, I say unto thee, Except a man be born of water and of the Spirit, he cannot enter into the kingdom of God” (John 3:5). “To whom also he shewed himself alive after his passion by many infallible proofs, being seen of them forty days, and speaking of the things pertaining to the kingdom of God:” (Acts 1:3). “But when they believed Philip preaching the things concerning the kingdom of God, and the name of Jesus Christ, they were baptized, both men and women” (Acts 8:12). “The kingdom of God” would refer to the earthly kingdom of Jesus Christ in Matthew 21:43—the Pharisees wanted that kingdom but they did not want the King or His righteousness, so they would not be allowed to enter that kingdom. Remember our opening comments how that Israel must be redeemed before she can enter the Promised Land. Mark 9:47 (“it is better to enter into the kingdom of God with one eye, than having two eyes to be cast into hell fire”)—the establishment of the visible kingdom on earth. Mark 14:25 (“I will drink no more of the fruit of the vine, until that day that I drink it new in the kingdom of God”)—the establishment of the visible kingdom on earth—parallel Luke 22:16-18. Mark 15:43 (Joseph of Arimathaea waited for “the kingdom of God”)—the establishment of the visible kingdom on earth—parallel Luke 23:51. “There shall be weeping and gnashing of teeth, when ye shall see Abraham, and Isaac, and Jacob, and all the prophets, in the kingdom of God, and you yourselves thrust out” (Luke 13:28). “And they shall come from the east, and from the west, and from the north, and from the south, and shall sit down in the kingdom of God” (Luke 13:29). “And when one of them that sat at meat with him heard these things, he said unto him, Blessed is he that shall eat bread in the kingdom of God” (Luke 14:15). “And when he was demanded of the Pharisees, when the kingdom of God should come, he answered them and said, The kingdom of God cometh not with observation:” (Luke 17:20). “And as they heard these things, he added and spake a parable, because he was nigh to Jerusalem, and because they thought that the kingdom of God should immediately appear” (Luke 19:11). “Jesus answered and said unto him, Verily, verily, I say unto thee, Except a man be born again, he cannot see the kingdom of God” (John 3:3). “Confirming the souls of the disciples, and exhorting them to continue in the faith, and that we must through much tribulation enter into the kingdom of God” (Acts 14:22). This would be the Body of Christ participating in “the kingdom of God,” experiencing much trouble (persecution) before going to heaven forever. “And he went into the synagogue, and spake boldly for the space of three months, disputing and persuading the things concerning the kingdom of God” (Acts 19:8). Seeing as to Paul ministered to Jews here, he spoke about how Israel’s Messiah came according to the Old Testament prophets. He preached of how they rejected and crucified Him just as the Old Testament prophets had also predicted. He was now ministering through Paul’s ministry and offering salvation to them (lost Israel) through a new program (our program, the Dispensation of the Grace of God). “And when they had appointed him a day, there came many to him into his lodging; to whom he expounded and testified the kingdom of God, persuading them concerning Jesus, both out of the law of Moses, and out of the prophets, from morning till evening” (Acts 28:23). Again, seeing as to Paul ministered to Jews here, he spoke about how Israel’s Messiah came according to the Old Testament prophets. He preached of how they rejected and crucified Him just as the Old Testament prophets had also predicted. He was now ministering through Paul’s ministry and offering salvation to them (lost Israel) through a new program (our program, the Dispensation of the Grace of God). “Preaching the kingdom of God, and teaching those things which concern the Lord Jesus Christ, with all confidence, no man forbidding him” (Acts 28:31). Once more, seeing as to Paul ministered to Jews here, he spoke about how Israel’s Messiah came according to the Old Testament prophets. He preached of how they rejected and crucified Him just as the Old Testament prophets had also predicted. He was now ministering through Paul’s ministry and offering salvation to them (lost Israel) through a new program (our program, the Dispensation of the Grace of God). “For the kingdom of God is not meat and drink; but righteousness, and peace, and joy in the Holy Ghost” (Romans 14:17). “For the kingdom of God is not in word, but in power” (1 Corinthians 4:20). “Know ye not that the unrighteous shall not inherit the kingdom of God? Be not deceived: neither fornicators, nor idolaters, nor adulterers, nor effeminate, nor abusers of themselves with mankind,” (1 Corinthians 6:9). “Nor thieves, nor covetous, nor drunkards, nor revilers, nor extortioners, shall inherit the kingdom of God” (1 Corinthians 6:10). “Now this I say, brethren, that flesh and blood cannot inherit the kingdom of God; neither doth corruption inherit incorruption” (1 Corinthians 15:50). “Envyings, murders, drunkenness, revellings, and such like: of the which I tell you before, as I have also told you in time past, that they which do such things shall not inherit the kingdom of God” (Galatians 5:21). “And Jesus, which is called Justus, who are of the circumcision. These only are my fellowworkers unto the kingdom of God, which have been a comfort unto me” (Colossians 4:11). “Which is a manifest token of the righteous judgment of God, that ye may be counted worthy of the kingdom of God, for which ye also suffer:” (2 Thessalonians 1:5). This would be how the Body of Christ is associated with “the kingdom of God,” suffering persecution before being caught up and glorified in heaven. The term “the kingdom of God” includes all of God’s workings. 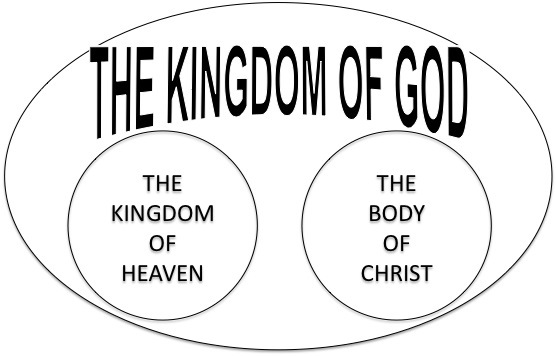 It is divided into two realms: “the kingdom of heaven” (redeemed nation Israel) and the Church the Body of Christ (Christians from our Dispensation of Grace). The context of the verse determines which of the two spheres is being referenced. In “the kingdom of God,” the God of the Bible is worshipped and served as King. This would immediately rule out lost people (unbelievers) and Satan and his angels. Satan is called “a king over all the children of pride” (Job 41:34). The phrase “the kingdom of heaven” refers strictly to the literal, physical, visible, earthly kingdom of Israel’s program, when heaven is brought down to Earth. Paul never uses the term “kingdom of heaven” to apply to us, the Church the Body of Christ. We have no inheritance in Israel’s earthly kingdom. We are God’s heavenly people, with an inheritance in the heavenly places. The Church the Body of Christ has a role in the government of heaven, as Israel has a role in the government of earth. Paul applies the term “the kingdom of God” to us, the Church the Body of Christ. Remember, opposite to redeemed Israel, the Church the Body of Christ is the other half of “the kingdom of God.” As the God of the Bible is glorified in redeemed Israel (Earth), so He is glorified in the Body of Christ (Heaven). He works in and through both of them. He is King (Ruler) in respect to both. In Israel’s program only, “the kingdom of God” and “the kingdom of heaven” are sometimes used interchangeably. Remember, for Israel, “the kingdom of heaven” is the literal, physical, visible representation of “the kingdom of God.” In the form of the Messiah/Christ Jesus, Father God will be with Israel, physically, literally, and visibly. The only aspect of “the kingdom of God” operating today is the Church the Body of Christ. There is no redeemed Israel today (yet future). Israel is currently fallen, and she will be restored after our dispensation. Today, there is no “kingdom of heaven” being preached, no earthly kingdom about to established, et cetera. Hence, Paul never used “kingdom of heaven” with reference to us in his epistles. » Is God finished with the nation Israel? » What does “My kingdom is not of this world” mean? Was Saul a pastor, a prophet, or an evangelist? Saul/Paul exercised numerous spiritual gifts, not just one or a few. APOSTLE. When Paul wrote his 13 epistles, Romans through Philemon, he wrote as “an apostle of Jesus Christ.” See Romans 1:1, 1 Corinthians 1:1, 2 Corinthians 1:1, Galatians 1:1, Ephesians 1:1, Colossians 1:1, 1 Thessalonians 2:6, 1 Timothy 1:1, 2 Timothy 1:1, and Titus 1:1. The God of the Bible, Jesus Christ, directly sent Paul to us Gentiles (Acts 9:15-16; Acts 26:15-18; Romans 1:5; Romans 11:13; Romans 15:16; Romans 16:25-26; 1 Timothy 1:11-16; 1 Timothy 2:5-7; Titus 1:1-3; et al.). PROPHET AND TEACHER. Acts 13:1-2 calls Paul a “prophet” and a “teacher.” He was a prophet in that he spoke on behalf of the God of the Bible. In 1 Corinthians 13:2, he claimed to have “the gift of prophecy.” Paul was one of the “prophets” and one of the “teachers” referenced in Ephesians 4:11. He was one of the “prophets” mentioned in 1 Corinthians 12:28 and Ephesians 2:20. PREACHER, APOSTLE, AND TEACHER. In 1 Timothy 2:7, Paul calls himself, “a preacher,” “an apostle,” and “a teacher of the Gentiles.” He was a preacher in that he proclaimed the Gospel of the Grace of God to all nations. As noted earlier, he was an apostle in the sense of being directly commissioned by the ascended Lord Jesus Christ. Paul was one of the “apostles” referenced in 1 Corinthians 12:28, Ephesians 2:20, and Ephesians 4:11. For over 30 years, Paul traveled throughout the then-known world, with signs and wonders often accompanying the Word he preached (2 Corinthians 12:12). Paul was a teacher in that he instructed Gentiles in the doctrine of this the Dispensation of the Grace of God. Paul was one of the “teachers” mentioned in 1 Corinthians 12:28 and Ephesians 4:11. PASTOR. Paul was one of the “pastors” referenced in Ephesians 4:11. He was a “pastor” in the sense that he would feed God’s flock. As a shepherd would guide his sheep, the Holy Spirit worked in and through Paul to guide the members of the Church the Body of Christ into the doctrines of grace. EVANGELIST. Paul also was an evangelist because he shared the Gospel of the Grace of God with others. He was one of the “evangelists” referenced in Ephesians 4:11. Paul had a number of spiritual gifts rather than one or a couple. Chiefly, he was an apostle, but he was also a prophet, an evangelist, a pastor, and a teacher. It is important to remember that Paul did not write as an evangelist or a preacher or a teacher. He wrote as an apostle, the highest authority that God gave to the Church the Body of Christ (1 Corinthians 12:28). It is quite a shock to most that God’s spokesman to us Gentiles in the Dispensation of Grace is not Jesus in His earthly ministry, or Peter or John or Jude. They did not have ministries in our mystery program—their ministry was to Israel first (Matthew 10:5-7; Matthew 15:24; Acts 1:8; Acts 3:24-26). The Apostle Paul had an all-men message and ministry (Romans 1:5,14; Romans 16:25-26; 1 Timothy 2:5-7). Paul was not sent to Israel first. As Israel would turn primarily to Moses, Genesis through Deuteronomy, to learn God’s Word for her, so we turn to Paul’s epistles, Romans through Philemon, to learn God’s information for us. We do not exalt Paul, but rather we magnify the ministry that the ascended Lord Jesus Christ gave him (Romans 11:13). By honoring what Jesus Christ honors, we honor Jesus Christ. Finally, note what the Holy Spirit moved Paul to write in 1 Corinthians 14:37: “If any man think himself to be a prophet, or spiritual, let him acknowledge that the things that I write unto you are the commandments of the Lord.” If we reject the Apostle Paul, then we reject what the Lord Jesus Christ had to say through Paul. What Paul wrote are the Lord Jesus Christ’s words to us Gentiles in the Dispensation of Grace. Dear friends, if we cannot believe these simple truths, or we cannot see these simple truths, we would do well to remove our denominational eyeglasses and toss them out! » Why was Saul’s name changed to Paul? » Could you please clarify Ephesians 2:18-22? » Who was Judas’ replacement—Matthias or Paul? Posted in DISPENSATIONAL BIBLE STUDY, Was Saul a pastor a prophet or an evangelist? Why did God reject Cain’s offering? WHY DID GOD REJECT CAIN’S OFFERING? WHAT LESSON CAN WE LEARN FROM THAT ACCOUNT? Have you ever wondered why God did not accept Cain’s offering? Was it because, as some suppose, Cain had a bad attitude? If not, what was the reason for God rejecting Cain’s offering? In addition, what lesson can we learn from this Old Testament historical narrative? We will be Bereans, and search the Scriptures for answers to these fascinating questions (Acts 17:10-11). Doubtless everyone who grew up in or around Christian churches or groups has heard of brothers Cain and Abel. While what happened between the two is common knowledge, the warfare associated with the story is largely overlooked. Sadly, the eternally significant part of the narrative is largely unknown! Dear readers, many billions of souls could have avoided a devil’s everlasting hell in which they now suffer, had they only critically considered and believed the lesson taught by the events of Genesis 4:1-8. It thus behooves us to survey and evaluate these verses. After sin entered the world by Adam (Romans 5:12), God demanded blood sacrifices for atonement (to make God and sinner “at one”). God shed innocent blood to cover Adam and Eve’s sin (Genesis 3:21). Outside of our dispensation, and before Christ came, those who wanted a right standing before God—”righteousness”—had to offer blood sacrifices by faith. “…[W]ithout the shedding of blood is no remission [forgiveness]” (Hebrews 9:22b). Cain had no faith, so he ignored God’s instructions and brought no blood. He brought the fruit (crops) of his own work, but Abel, by faith, brought blood sacrifices (obeying God). God accepted Abel’s sacrifice because Abel had faith! However, God rejected Cain’s sacrifice. Cain should not have been upset. He knew exactly what God wanted, and he knew God did not instruct him to bring an offering from the ground. We are some 6,000 years removed from Cain and Abel, and yet that story teaches us a valuable lesson of eternal worth. “So then faith cometh by hearing, and hearing by the word of God” (Romans 10:17). “By faith Abel offered unto God a more excellent sacrifice than Cain…” (Hebrews 11:4). The LORD gave Cain and his brother Abel clear instructions. Only Abel did what God said because only he believed what God said. Abel, a shepherd (Genesis 4:2), “brought of the firstlings of his flock and of the fat thereof” (verse 4a). Cain, a farmer (verse 2), “brought of the fruit of the ground an offering unto the LORD” (verse 3). Notice what Abel brought—a sheep, a blood sacrifice, and its fat, which is what God said to do. Observe what Cain brought—something he grew. Cain had probably slaved away watering that crop, weeding that patch of ground, and so on. Cain brought the very “best” he could bring—it was the work of his own hands. He rationalized, “Surely, God will accept this fruit of the ground. He knows I put so much effort into it. How can He say no?” When Cain saw the fire of God come down from heaven and consume his brother’s sacrifice, and yet nothing happened to his sacrifice, Genesis 4:5 tells us that Cain grew very upset. “How dare You, God! It was my very best, and You do not want it!” Cain probably threw a tantrum and cursed. Eventually, filled with that religious rage, he murdered Abel (verse 8). Cain symbolizes today’s average religious person, who refuses to do what God’s Word says: “Trust in the finished crosswork of Christ alone and I will save you.” Like Cain, they offer “their absolute best”—tithes, water baptism, acts of charity, penance, church membership, et cetera—things God never commanded them to do for salvation! Those things are “filthy rags” (Isaiah 64:6) when compared to Jesus Christ’s perfect sacrifice of Himself. And when they die, like Cain, they will be greatly disappointed. God instructed Cain and Abel to bring blood sacrifices. However, only Abel obeyed God because he alone had faith. Cain lacked faith, so he completely ignored God’s Word. Cain wanted to do what Cain wanted to do. This is typical human nature, and it has not changed one wit. Man is naturally sinful in that he seeks autonomy—to be his own god and to do what he wants to do. “Cain… was of that wicked one [Satan! ]… his own works were evil, and his brother’s [Abel’s] righteous” (1 John 3:12). Now, Cain’s vegetation offering did not look evil—it was just “fruit of the ground” (Genesis 4:3). Yet, despite its innocent appearance, it was evil and God rejected it. How was it evil? God wanted blood sacrifices, not crops! Cain displeased God because he had no faith (Hebrews 11:6). Now, apply that scenario to today. Billions of church members are doing everything they can to work for heaven. Like Cain, they completely ignore God’s Word when it says their “good” works are actually “filthy rags” (Isaiah 64:6) and “dung” (Philippians 4:8). They give faithfully, pray daily, attend church weekly, help the poor, clean the church, sing in the choir, and so on. Sadly, this is vain activity, for God never commanded them to work for heaven! In this the Dispensation of Grace, God is freely offering His grace, love, mercy, forgiveness, salvation, acceptance, fellowship, and righteousness in the Person of His Son Jesus Christ. “But to him that worketh not, but believeth on him [Jesus Christ] that justifieth the ungodly, his faith is counted for righteousness” (Romans 4:5). Salvation is so simple, yet religion complicates it with our works. We sinners cannot work for salvation. The Bible says the only way to heaven, and everlasting salvation, is to trust in what Jesus Christ already did for you, not what you can do for Him. According to God, Abel brought “of the firstlings of his flock and of the fat thereof” whereas his brother Cain offered “fruit of the ground” (Genesis 4:3-4). Cain’s offering appeared innocent, but God considered it “evil” (1 John 3:12). Why? “Without faith, it is impossible to please him [God]” (Hebrews 11:6). Cain did not please God. He did not believe anything God said, so he ignored God’s command to bring a blood sacrifice. No blood sacrifice indicated no faith. Essentially, Cain was ignoring what that blood sacrifice represented: the blood of the coming Redeemer Jesus Christ! Sadly, today, mankind generally shares Cain’s attitude in refusing to believe God’s Word, especially regarding salvation. God has told them they are “guilty” sinners who cannot work for salvation, but they refuse to listen. God wants them to trust in His Son alone, but they want to trust in their works and His Son. God will not have it. Jesus Christ is “well pleasing” to God the Father, we are not (Matthew 3:17; Matthew 12:18; Matthew 17:5; Mark 1:11; Luke 3:22). Please be not one of the billions of precious souls attempting to appease God and merit salvation and heaven with their “good” works. Like Cain’s offering, this “innocent-looking” activity is evil! (Remember, even Jesus claimed some “good” works were “iniquity” in Matthew 7:22-23). These “good-works” people are attempting to substitute Christ’s perfect blood sacrifice on Calvary with their “dung” and “filthy rags” (their “good” works). God will not have it. God wants our faith exclusively in what His Son Jesus Christ did for us. Has Jesus Christ’s blood been imputed to your account? If it has, that blood applied to you indicates your faith! If Jesus’ blood has not been imputed to you, you need to trust exclusively in the Lord’s finished crosswork on Calvary. For salvation, God will accept nothing else but your faith resting in Christ Jesus alone. Posted in CREATION AND EARLY MAN, SOUL SALVATION FROM SINS, Why did God reject Cain’s offering?, Why did God reject Cain’s offering? Does not Acts 11:15 prove the Body of Christ began in Acts 2? DOES NOT ACTS 11:15 PROVE THE CHURCH THE BODY OF CHRIST BEGAN IN ACTS 2? Acts 11:15 says, “And as I began to speak, the Holy Ghost fell on them, as on us at the beginning.” What was that “beginning” found in Acts chapter 2, the day of Pentecost? Is this verse saying that Acts chapter 2 was the beginning of the Church the Body of Christ? While some have used this argument to force us into Pentecost, we will see what the Bible really says. Unless we have a denominational bias to hinder our understanding, this verse is amazingly simple. There are one-dozen reasons why the Church the Body of Christ did not begin in Acts chapter 2 on the day of Pentecost. (Please see our study linked at the end of this article.) To use one verse—Acts 11:15—to argue against dozens of verses is absolutely ridiculous. In fact, for someone to use Acts 11:15 in that manner is to demonstrate a desperate attempt to hang on to Pentecost with whatever it takes. Tradition is awfully difficult to abandon! Acts 2:41 reads: “Then they that gladly received his word were baptized: and the same day there were added unto them about three thousand souls.” If the Body of Christ really began at Pentecost, and the 12 apostles were saved before Pentecost, of what body of believers were they members? Obviously, there was “church” that existed prior to Acts chapter 2. That group was the “little flock” of Luke 12:32, the Messianic Church of Matthew 16:16-18. After Peter preached his famous sermon on Pentecost, the Bible says other disciples were “added unto them.” Again, on Pentecost, there was a preexisting group of believers. There is nothing, nothing, nothing new in Acts chapter 2, but rather it is a continuation of something already there. Now, regarding Peter’s words in Acts 11:15, “And as I began to speak, the Holy Ghost fell on them, as on us at the beginning.” This certainly refers to Acts chapter 2, when the Holy Spirit came down from heaven and filled the apostles. (In chapter 11, Peter is saying that a similar event occurred with Cornelius in chapter 10.) That “beginning” refers to the beginning of the “last days” of Israel’s program (see Joel 2:28-29 and Acts 2:17-18). Peter, led by the Holy Ghost, says that the events of Pentecost are the “last days,” not the first days of anything. They are a further development of Israel’s prophetic program. Israel has just rejected and crucified Messiah Jesus (just as the Old Testament prophets predicted), the Holy Spirit has come (as the Old Testament prophets foretold), and now the wrath of God is coming (just as the Old Testament prophets predicted). Everything the prophets spoke of in the Old Testament is being fulfilled, and Peter is warning in Acts chapter 2 that the worst is yet to come! The “beginning of the final days of Israel’s program” is the only beginning that would make sense in Acts 11:15 and Acts chapter 2, considering the Body of Christ and our Dispensation of Grace are not spoken of in the Old Testament. » Did the Church the Body of Christ begin in Acts 2? » When did the Church the Body of Christ begin? » What is the “church” spoken of in Matthew 16:18? Posted in BIBLE CONTRADICTIONS / CONFUSING VERSES SIMPLIFIED, DISPENSATIONAL BIBLE STUDY, Does not Acts 11:15 prove the Body of Christ began in Acts 2?, Does not Acts 11:15 prove the Body of Christ began in Acts 2?